NSi4’s Car Stories is quickly racing up the charts on Facebook, as car fans are challenged to build and research exotic vehicles in this car-themed city-building game. 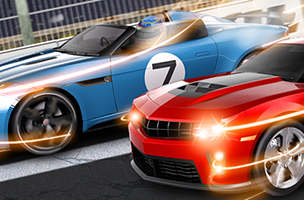 Designed as a car collection game, players in Car Stories will build garages, research buildings and more to increase their collection with classic rides as well as sports cars. Each car in a player’s collection generates money over time, and players can tune these cars to increase their revenue by spending “parts,” a free currency. Players can generate these parts by completing jobs, with different jobs taking longer to complete and offering different rewards. Once cars are tuned, they can be combined in the research center for a chance to win new cars, exhausts and other car parts. Players are given a preview of some of the items they can create through research, with both premium and free currency “boosts” being available for purchase to alter the outcome. Car Stories leads players through a quest system for progression, and allows players to expand into new areas, chop down trees and other basic city-building tasks as they build their car production facilities. The game is available to play for free on Facebook, and has over 387,000 monthly active users (MAU) as of this writing. Check back soon to follow Car Stories on AppData, our tracking platform for mobile and social apps and developers.